Michael Simmons was born about 1851 in London, the son of Samuel (d.1881) and Matilda Simmons. His wife may have been Mary, daughter of Casper Flick of Windermere, Lochinvar, near Singleton NSW. Michael Simmons died at Redfern on 16 December 1894, aged 43, survived by his widow and six children. His funeral was a major civic occasion and he was buried with Jewish and Masonic rites in the Old Jewish section of Rookwood Cemetery. Mourners included his sons Samuel and Raphael M Simmons and his brother Abraham Simmons. Michael Simmons arrived in Sydney as a child with his family. By 1885, he was established as a cigar maker and tobacconist at 728 George Street and also at 423-27 Sussex Street. His private residence was 150 Pitt Street, later Cleveland Street, Redfern. 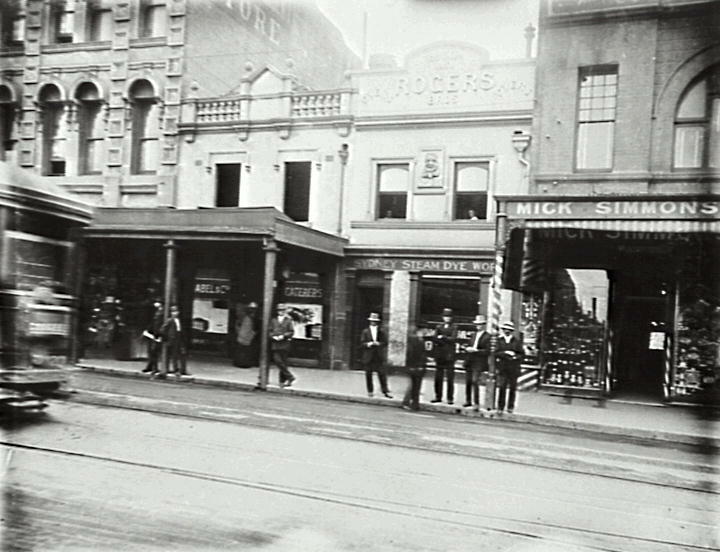 In 1895 his well-known shop on the corner of George and Campbell Streets had become one of the largest tobacco and fancy goods businesses in the city. He was a major shareholder and managing director of the New York and Brooklyn Tobacco Factory, located in Cleveland Street near his Redfern residence. In 1968, Mick Simmons holdings were taken over by Nelson Tobacco Ltd.
Michael Simmons was a trustee of the Theatrical Carnival Fund and a member of the committee of the Firemen’s Widows Fund. He was a member of the Robert Burns Masonic Lodge. 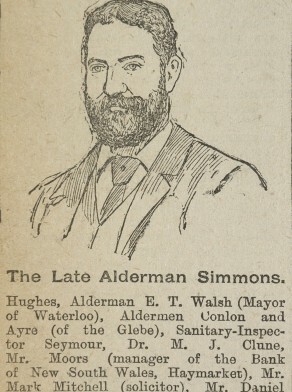 Michael Simmons stood unsuccessfully for City Council in 1889. He was elected Alderman for Phillip Ward from 1 December 1892 to the time of his death in December 1894.